LAID - Legally Armed In Detroit (Michigan CPL CCW Classes): FAQ: What Do I Need To Do To Legally Have A Firearm In My Michigan Home? FAQ: What Do I Need To Do To Legally Have A Firearm In My Michigan Home? Q: What do I need to legally have a gun in my home in Michigan? A: You do not need a license to have a firearm in your home or in your business in the state of Michigan. However, your firearm ownership rights must be intact: no felonies, no misdemeanor domestic violence convictions, no PPOs, no history of mental illness, and etc. Rifles and shotguns do not require registration, so one can buy a long gun from a gun shop, friend, or a private person without getting a permit. 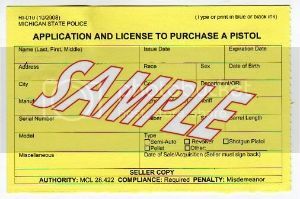 If a person without a CPL wants to buy a handgun from a non-firearms dealer, he will need to apply for and obtain a 30-Day Pistol Purchase Permit from his local law enforcement agency. He will have 30 days to buy. If he doesn't do so within the specified 30 day window, he'll need another purchase permit. After he buys a handgun, he'll still need to file the paperwork to register his handgun within 10 days. Alternatively, if a person is buying a handgun from a gun dealer, he will not need a Pistol Purchase Permit. The dealer will run the necessary background checks at his location. Moreover, if a person has a Michigan Concealed Pistol License, he will not need a Pistol Purchase Permit regardless of where he buys the handgun. In either case, the handgun will still need to be registered within 10 days or the buyer could be found responsible for a civil infraction which carries a $250 fine as a penalty.